Like Vietnam, Cambodia is also influenced by French Cuisines, bread is one of the most popular and typical food of Cambodia. Num Pang is a famous street food in Phnom Penh. When you see bread with butter, pate, sauce, chili, salad, some pieces of carrot or papaya with meat and aromatic herbs inside, it is Num Pang. Num Pang is convenient for you to eat. You can eat Num Pang when moving or sitting in front of an eating table for breakfast. 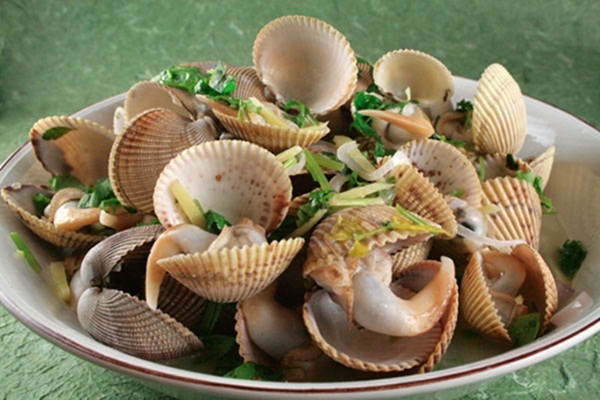 Vietnamese tourists are so familiar with the food named Num Pang. Tourists can see Num Pang in any street. Kandal market on the road No.5 is an ideal address for you to taste Num Pang. It is the second highlight food. It is “national food” of Cambodian people. 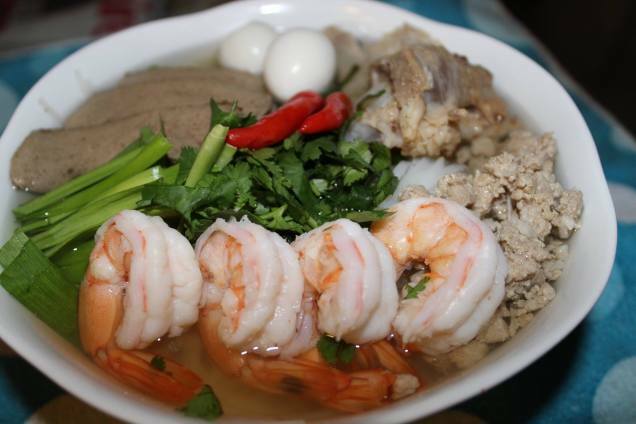 Nom Banh Chok noodle is eaten by residents in Cambodia every morning. Nom Banh Chok is made from special fermented rice, and then soused with fish-curry-sauce. You will smell aroma of lemongrass, lemon leaves and turmeric mixed into fish-curry-sauce. On streets in Phnom Penh, you can meet hawkers who sell Num Banh Chok noodles with a big pot of fragrant curry sauce and fresh veggies that are used for eating with noodles. 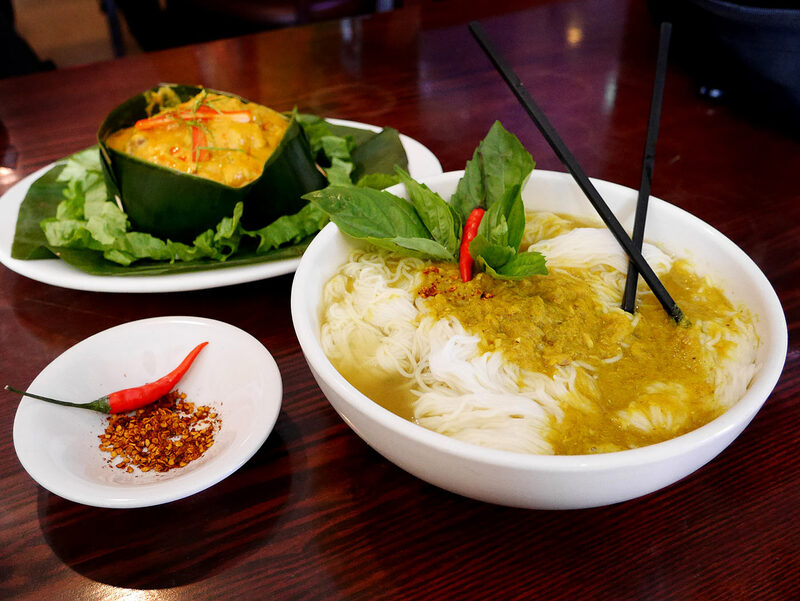 Don’t forget to try eating a bowl of these special noodles with a small basket of cucumber slices, bean sprouts and chili sauce. You should come to Russian market on the road No. 440 to get the best bowl of Nom Banh Chok noodle. Bai Sach Choruk in is similar to Broken Rice (Com Tam) of Vietnam. 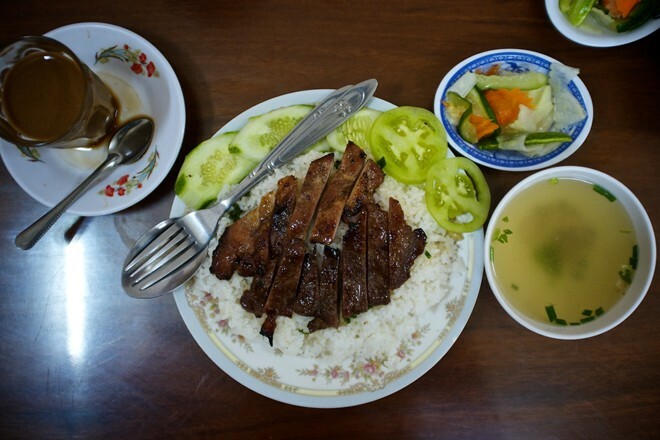 If you travel to Phnom Penh and Vietnam, you should not pass the chance of tasting 2 these highlight dishes. 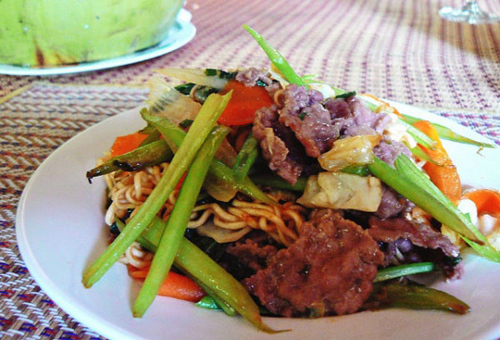 You should walk to Kandal market on the road No.5 in Phnom Penh and try eating this dish. 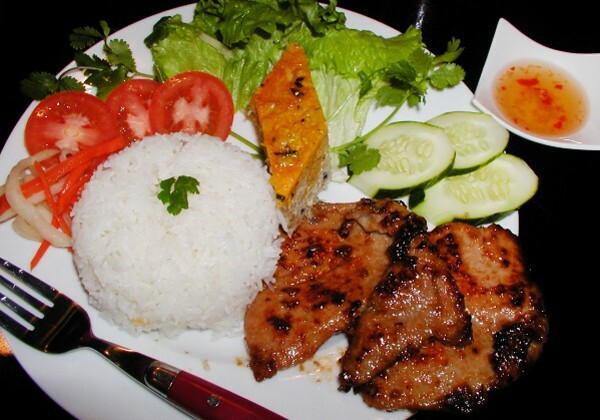 This lovely dish is similar to Banh Troi in Vietnam. 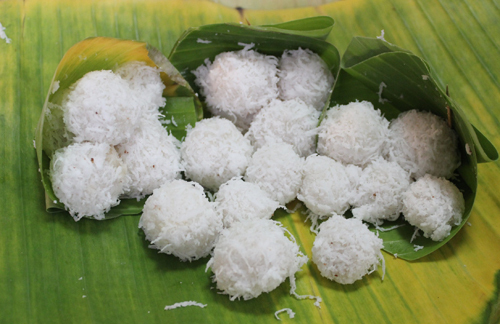 Num Plae Ai is made from finely milled rice flour, molded into a round shape with sugar inside and then it is parboiled. Cooked rice cakes are dipped into a bowl of caramel and then this cake will be decorated by some yarn of fresh coconut above. You should spend time to taste Num Plae Ai slowly. You can have good Num Plae Ai on the road named 258 and Sisowath Quay in Phnom Penh. Mi Char is familiar to students in Cambodia after stress lessons at school. You can see Mi Char in any street in Phnom Penh. Mi Char can make grumpy customers satisfied. Only in 5 minutes, the chef will finish Mi Char dish for you. Noodles are put in the pan and fried with beef. Fried eggs and aromatic veggies like cilantro, mint leaves, marjoram, lettuce and some other kinds of vegetable are displayed on the plate and you can enjoy your meal with Mi Char fried noodle. You can add a bit chili sauce into Mi char so that this dish will be more delicious. Center market on the road 53 in Phnom Penh is a good place to taste Mi Char. Phnom Penh clear rice noodle soup is a highlight food. It is derived from Chinese. It is regarded as a perfect breakfast in Cambodia. Noodles are made from white rice. Noodles, beef or pork broth, onion slices, bean sprouts, chives, fresh shrimp are mixed with chili sauce make a perfect taste for this noodle soup. Phnom Penh clear rice noodle soup is a special food that no one can ignore when travelling to here. You can go along Pencil road on Sisowath Quay road to get this highlight food in Phnom Penh. On mobile stalls of hawkers on streets in Phnom Penh, there are many pots of oysters steamed with chili, lemon leaves and lime leaves. This smell attracts us in night. Don’t miss the chance of trying lemongrass steamed oysters Ngeav Chamboy in Phnom Penh and drinking cold beer to enjoy this specialty food in this tropical city. The road No.13 is full of Lemongrass steamed oysters Ngeav Chamboy. This is a strange dish to tourists. It is delicious and nutritious. Chef will get rid of pumpkin’s seeds and then pumpkin is stuffed with mixture of coconut fruit, sugar and egg yolks. After that pumpkin will be steamed. Waiting until finishing cooking pumpkin, we can taste this highlight food then. I’m sure that you will be persuaded by this dish because it is not only eye-catching but also tasty. Orussei market on the road No.182 in Phnom Penh is the heaven of Num Sang Khya l‘peou (pumpkin stuffed egg yolks). Like Vietnam, Cambodia is also a tropical country so there are many kinds of fruits in this country are waiting for you to taste. 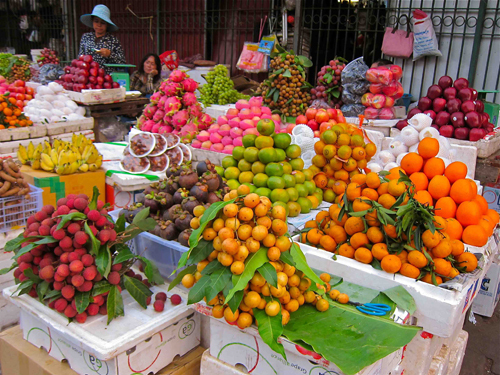 Fresh fruits in Phnom Penh are diversity. 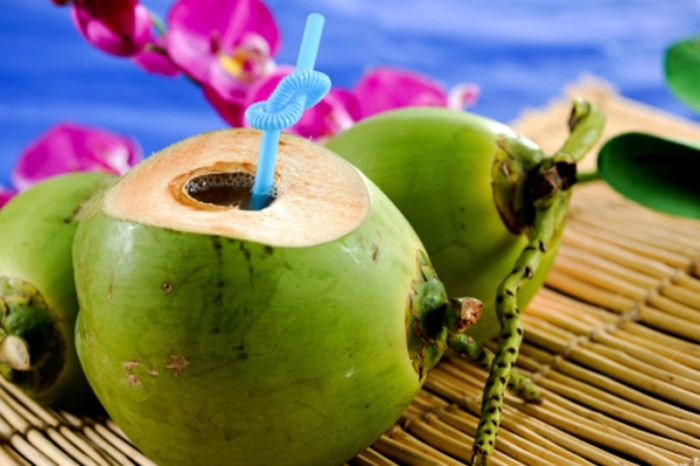 Vietnam has papayas, pineapples, guavas, watermelons, mangoes, dragon fruits and many other fruits. So Cambodia does. 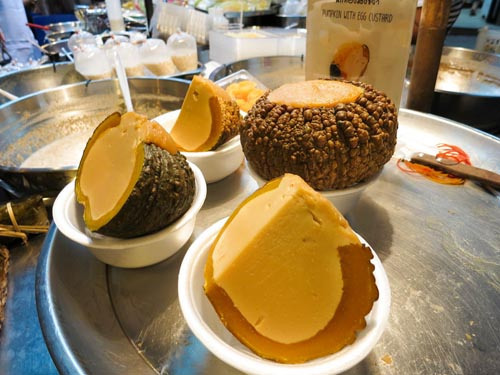 You will have chance to taste many kinds of fruits in heaven fruits like Cambodia. So it is easy for you to see fresh fruits displayed along the roads in Phnom Penh. Highlight address of fresh fruits is on the road No.258 and Sisowath Quay road. 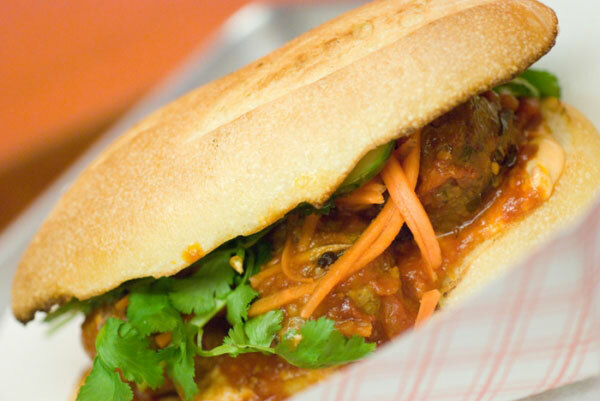 In general, highlight street foods in here are similar to street foods in Vietnam. Cambodian people have snaking habits so Phnom Penh- capital city of Cambodia has so many highlight street foods that attract tourists in all over the world. Are you making plan to travel to Phnom Penh? Don’t forget to spend time tasting all highlight street foods I just want to say that Phnom Penh street foods are great.